In working with our clients, we sometimes become too concerned with how to keep the important areas from being cut out for windows, medicine cabinets, doors, etcetera, and not enough about making the mural into a piece of art. If the wall mural on a wall is indeed the canvas, then the "art" or chart should have the elements of good, framed art. One of these principles is the rule of thirds. The Rule of Thirds helps us keep the focal area out of dead center, where the focal area is stagnant and the most uninteresting place for the important part of the mural. Put simply, the Rule of Thirds divides the height and width into three, equal sections. The imaginary lines that divide the area into thirds appear as a giant tic-tac-doh sign, or "hashtag" for you Twitterites in the audience. Wherever the lines cross in one of four places, that is where your focal area would ideally appear in the intersections. 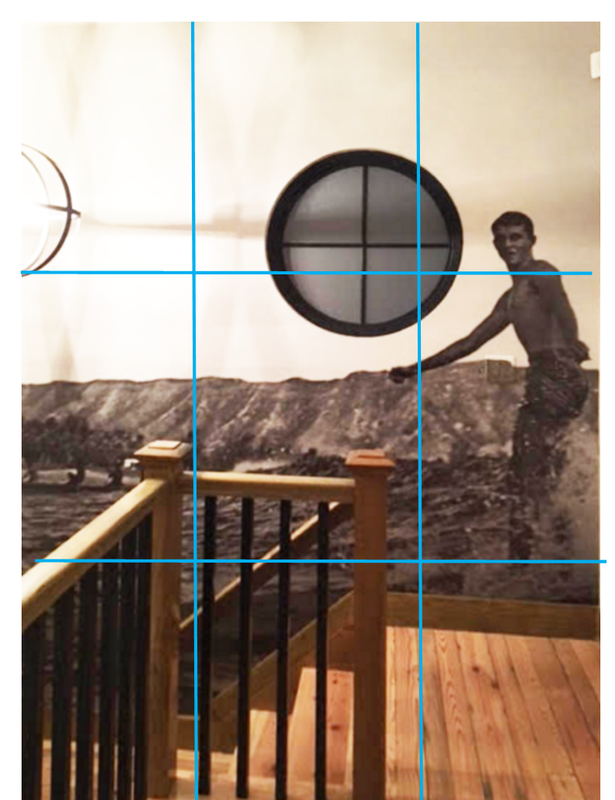 With "Surf Dad" the mural actually goes down one level of the staircase. Making the lateral thirds equal, the top crossing area is near the head of the surer and includes part of the circular window. But positioning the surfer near the top right of the Rule of Thirds makes the scene seem dynamic as he "surfs" down the staircase! In another example, two crossing points bring out the focal area of Stove Point Neck and Fishing Bay. Note the top left crossing and the bottom left crossing which brings out both Stove Point Neck and Fishing Bay. If the Rule of Thirds is new to you, here's a homework assignment. Go to a movie. Any movie. then imagine the screen cut into thirds, top, bottom, and from side-to-side. Notice how many scenes use the rule of thirds. In each case, those are the scenes where the subject matter REALLY matters! In the meantime, give us a call at 801-367-7945 and we'll be happy to discuss your mural ideas!